The numbers tell the story when it comes to the Detroit Red Wings' performance over the past two decades, beginning with their sudden rise to NHL prominence in the 1991-92 season. Over the past 19 seasons, Detroit teams have enjoyed a .660 winning percentage in the regular season, averaging 47 wins and dropping below 40 only once in a full 82-game season. They have won 50 or more games six times, tying an NHL record of four straight 50-win seasons from 2005-06 to 2008-09, to establish themselves as a model for success. Indeed, the current Red Wings organization is right there in stature with the Montreal Canadiens of the 1970s and 1980s -- the only other NHL team to post four consecutive 50-win seasons. Those Habs did win more Stanley Cup championships (seven total) and had a higher regular-season winning percentage (.669), but they also played in a league nearly half the size of the current NHL and one with far less parity. It's not the Stanley Cup, but the trophy given out each year at Traverse City, Mich., has taken on more and more meaning and is designed to be a predictor of Stanley Cup championships to come. What the Red Wings have done in an expanded NHL that has included six seasons with a salary cap is truly historic. Detroit's 19-year run encompasses 14 regular-season division titles (two more than Montreal), nine regular-season conference titles (one ahead of Montreal), six Presidents' Trophy wins as the NHL's best regular-season team (two more than Montreal), six appearances in the Stanley Cup Final, and four Cup championships. They don't call it Hockeytown for nothing. What makes Detroit's story so compelling -- and shines as an example of what every NHL team can be -- is that the Wings have done all of this through their commitment to scouting, brilliant drafting, and a relentless emphasis on player development to help compensate for their annual draft position. Since they won their first Stanley Cup in 1997, the Wings have never had a draft pick above No. 19 overall in the first round. And over the 20 drafts from 1992 to 2011, there were nine times when the Wings didn't even have a first-round pick. Nothing says more about the Detroit philosophy than the formation of the annual Traverse City Prospects Tournament at the Wings' Traverse City, Mich., practice facility in 1998. A club that had just won the Stanley Cup in back-to-back years decided to open its doors to other teams in the interest of helping develop its own prospects. By giving their youngsters a chance to play competitive games against other NHL hopefuls, they could measure them against their peers rather than in a training camp situation where they would be overshadowed by veterans. Some 13 years later, the Wings have yet to win their own prospects tournament, but the annual event has helped strengthen their power at the NHL level -- which was always the tournament's goal. Several members of the Red Wings' 2002 and 2008 Stanley Cup teams began their careers in Traverse City, a group that includes current stars Pavel Datsyuk, Henrik Zetterberg, and Niklas Kronwall. • Sept. 10 -- vs. St. Louis at 7 p.m.
• Sept. 11 -- vs. Dallas at 6 p.m.
• Sept. 13 -- vs. Carolina, 3:30 p.m. The Wings haven't been the only team to benefit. Seven members of last season's Rangers "young core" -- Artem Anisimov, Ryan Callahan, Brandon Dubinsky, Michael Sauer, Marc Staal, Derek Stepan, and Ryan McDonagh -- all wore the Blueshirt for the first time in competition at Traverse City. The tournament's dozens of alumni now in the NHL also feature Ilya Kovalchuk and Dany Heatley, as well as Jeff Skinner, last season's Calder Trophy winner. Traverse City's beginnings were humble indeed. In both 1998 and 1999, the Wings invited only division rivals Chicago, St. Louis and Nashville up to their practice facility. Ironically, the first event was won by an expansion Nashville organization that had yet to make its NHL debut. The addition of Columbus and Atlanta in 2000 marked the first of two tournament expansions. In the event's third year, the field grew from four teams to six, as the Thrashers became the first team from outside the Central Division to compete at Traverse City. By 2001, Minnesota had replaced Chicago, and the Wild would appear in all but one of the next 10 tournaments. The 2002 field was narrowed down to five teams after Columbus temporarily dropped out. 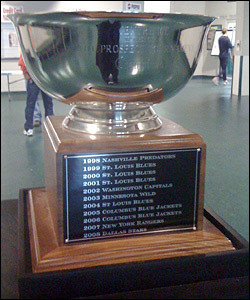 Washington was brought in to replace Nashville, and the Caps won the tournament in their first appearance. In 2003, Tampa Bay was added to regain a full complement of six teams, but the field shrunk to an all-time low of just three teams -- Detroit, Tampa Bay, and St. Louis -- on the eve of the NHL lockout in 2004. In 2005, Washington and St. Louis dropped out of the field for financial reasons, but Atlanta returned to make it a five-team event. Perhaps the most important moment in tournament history came in 2006, when the field was widened to the current eight teams. The new additions were the Rangers and Dallas, who were both delighted to be part of what was quickly becoming the premiere preseason test for young NHL hopefuls under the age of 24 with no more than one year of North American professional experience. Tournament rules stipulate that no team can carry more than four players who have played professionally, enabling the event to spotlight the youngest players with a special emphasis on recent draft picks. In the five years since Traverse City went to eight teams, there have been only a few minor adjustments to the participating group. Carolina replaced Tampa Bay in 2009, and the Lightning returned to replace Atlanta in 2010. Tampa Bay exited the tournament again this year and will be replaced by Buffalo, which will make its debut as the 13th NHL team to send its prospects to Traverse City for at least one of the 14 tournaments. As champions in 2007, the Rangers became one of the eight teams that have won Traverse City titles. Here is a look back at past champions.